In a nutshell, people are running out of their own money as they age. 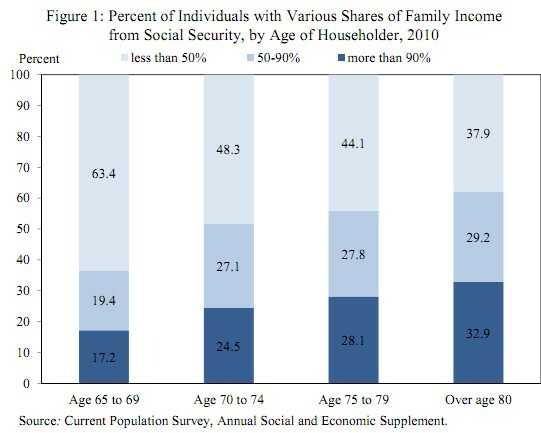 This is evident in the increasing reliance on Social Security as people reach age 80. This will make it easier for defined benefit plan sponsors to offer a combination of lump sum and annuity payouts. Currently, it is largely an all-or-nothing proposition for defined benefit plan sponsors and plan participants. The required minimum distribution that applies to the 401k and individual retirement account (IRA) markets impedes the use of longevity annuities or longevity insurance. Under the proposed fix, the required minimum distribution would be waived for a portion of “qualified” (401k and IRA) funds, so long as the amount does not exceed the lesser of 25 percent of the account balance or $100,000. This ruling makes it clear that an employer may offer a low cost annuity option through its defined benefit pension plan. Issues related to spousal consent have been obstacles to adoption of deferred annuity options (including longevity annuities) in 401k plans. This ruling removes some of the burden and complexity surrounding spousal consent rules for 401k plan sponsors who are interested in offering a deferred annuity option.